Injuries to cornerstone players have defined the season for the Yankees, who are likely to see right fielder Aaron Judge hit the IL next. But there is better news regarding banged-up catcher Gary Sanchez and third baseman Miguel Andujar, who, like Judge, are among New York’s offensive linchpins. Sanchez, on the IL with a left calf strain since April 11, will play a minor league rehab game Monday and should then return to the Yankees’ lineup Wednesday, per David Lennon of Newsday. Meanwhile, the Yankees “continue to be optimistic” that Andujar will come back this season, according to manager Aaron Boone (via Lennon). Andujar hasn’t played since March 31 because of a labrum tear in his right (throwing) shoulder, an issue the team has feared could require season-ending surgery. However, the majority of recent Andujar updates have been positive, and that’s all the more heartening for the Yankees given their injury-ravaged state. Blue Jays right-hander Matt Shoemaker suffered a left knee sprain Saturday and will undergo an MRI on Sunday, Ben Nicholson-Smith of Sportsnet reports. A stint on the injured list looks like a legitimate possibility for Shoemaker, who was frequently on the IL during his Angels tenure. The first-year Blue Jay, whom they signed for $3.5MM in free agency, looked like a quality bargain pickup for the club prior to his latest injury. Shoemaker threw three scoreless innings against Oakland before departing Saturday, leaving him with a 1.57 ERA/3.80 FIP, 7.53 K/9, 2.83 BB/9 and a 51.4 percent groundball rate in 28 2/3 frames this year. Rays second baseman Joey Wendle is nearing activation from the IL, Marc Topkin of the Tampa Bay Times tweets. A left hamstring strain has kept Wendle out since March 31 and given the keystone to Brandon Lowe, who’s enjoying an outstanding season thus far. Wendle was effective in his own right in 2018, when he batted .300/.354/.435 (116 wRC+) with 3.7 fWAR in 545 PA.
6:40pm: Minnesota has issued a press release to announce the signing. 3:36pm: Free agent second baseman Jonathan Schoop is finalizing a one-year deal with the Minnesota Twins. The deal will be worth $7.5MM plus incentives, per the Athletic’s Ken Rosenthal (Twitter links). A physical has already been completed, he adds. Schoop, 27, represents a high-upside play for the Twins on a team full of them. He joins fellow non-tender C.J. Cron in the infield, but the Twins also figure to give bounceback hopefuls Byron Buxton and Miguel Sano a chance to get their careers back on track. Schoop and Sano were both All-Stars in 2017 when Buxton won a Gold Glove and finished 18th in MVP voting (Schoop finished 12th). Production from all three cratered last season. The former Orioles and Brewers second baseman was one of the more interesting free agents available given his on-field volatility. He disappointed in Milwaukee, managing a meager .202/.246/.331 with four home runs after he was acquired at the trade deadline — but it wasn’t that long ago that Schoop put up a 5.2 rWAR season in Baltimore. Schoop has three consecutive seasons of more than 20 home runs, including a career-high 32 dingers during that tremendous 2017 campaign with the Orioles. Brewers GM David Stearns recently took responsibility for the deadline deal in a recent piece from Tom Haudricourt of the Milwaukee Journal Sentinel. The Brewers surrendered quite a bit of talent for what turned out to be only a half season of less-than-ideal contributions from Schoop, who lost playing time in the playoffs to regular third baseman Travis Shaw. The Brewers chose not to tender Schoop a contract rather than pay him the projected arbitration salary of $10.1MM. Schoop will take only a small pay cut from the $8.5MM he earned last year, though his final earnings may, of course, change depending on the particulars of the incentives involved. With the non-tender deadline looming tomorrow, there’s a “strong possibility” the Brewers will non-tender infielder Jonathan Schoop, according to Ken Rosenthal of The Athletic (via Twitter). A trade route is also possible, per the report; the takeaway, regardless, is that the Milwaukee organization seems to be preparing to move on. That’d be a tough pill to swallow, given that the Brewers acquired Schoop just last summer in anticipation of a turnaround. That did not come to pass late in 2018, and evidently the organization isn’t all that optimistic that the bounce back will occur in the season to come. Or, at least, it’s not willing to pay what it’ll take to find out. In his final season of arbitration eligibility, MLBTR and contributor Matt Swartz project, Schoop will take down something on the order of $10.1MM. That’s an easy payday to commit to for the 2017 version of Schoop. He slashed a robust .293/.338/.503 with 32 long balls and turned in solid defensive work, making him a comfortably above-average regular. Last year, though, the bottom dropped out. While he continued his solid glovework, and even showed that he can handle shortstop, Schoop’s bat fell apart. He still had good power, but ended the season with only a .233/.266/.416 slash. The difference on the stat sheet primarily comes down to quality of contact. Schoop’s batting average on balls in play plummeted from .330 in 2017 to .261 last year. Since he rarely walk, that devastated his on-base percentage. And it’s hard to chalk it up to bad luck, as Statcast actually suggests he enjoyed good fortune (.290 wOBA vs. .266 xwOBA). If the Brewers do indeed pull the plug, it’ll reflect not only their feelings about Schoop, but also of the remainder of the market. The organization may anticipate better opportunities to improve its infield mix; after all, at second base especially, there are numerous open-market and trade options. With other needs to address as well, and perhaps not a lot of available money to work with, there certainly could be an opportunity for the Brewers to add a solid second base asset at a lower price — or even to pursue other, more creative roster tweaks. Jonathan Schoop is a key figure in the Brewers’ offseason plans, Tom Haudricourt of the Milwaukee Journal Sentinel writes, as the club’s decision whether or not to tender the second baseman a contract could have a ripple effect throughout the infield. Schoop is projected to earn $10.1MM via arbitration, though he is coming off a rough season that saw him hit just .233/.266/.416 over 501 plate appearances for the Brewers and Orioles. Since Schoop did post big numbers for the O’s in 2017, however, Milwaukee could keep Schoop in the fold to see if he can regain that form. If Schoop was non-tendered, the Brewers could again consider moving Travis Shaw to second base (as they did last season) and then pursue third base help, possibly in the form of a reunion with Mike Moustakas. I’d also suggest that the Brewers could simply try to acquire another second baseman if Schoop was non-tendered, as there are several interesting options available that might be preferable to taking the defensive hit that would likely come with Shaw getting regular second base duty. GM David Stearns was quick to dismiss the possibility that Keston Hiura, Milwaukee’s top prospect, could be a possibility for the second base job, as Hiura has yet to even reach the Triple-A level. The Nationals are thought to be “aiming higher” in their search for starting pitching rather than trying to swing buy-low trades for Marcus Stroman or Sonny Gray, Chelsea Janes of the Washington Post writes. Janes’ piece in general looks at the pitching options open to the Nats on the trade market, and while GM Mike Rizzo doesn’t often make deals for notable starters, he is willing to pay a significant price when he does covet an arm. Washington parted with seven total players to acquire Doug Fister in 2013 and Gio Gonzalez in 2011, and since those trades, Rizzo has preferred to rely on free agency or homegrown arms to bolster the rotation. With so many interesting starters available in trade talks this winter, however, it wouldn’t be surprising if Rizzo went that route instead of making another signing. Speaking of Stroman, the Blue Jays have been asked about the right-hander but have yet to enter into any significant trade talks. The Athletic’s Andrew Stoeten (subscription required) feels the Jays should be willing to deal Stroman even at something of a sell-low price, since a slow start in 2019 would further diminish any real trade value Stroman possesses. Since Toronto doesn’t seem to be planning to contend again until 2021, Stoeten feels the Jays should be exploring deals for any player (like Stroman) whose isn’t under team control in 2021 or beyond. Second baseman Jonathan Schoop has endured a dreadful couple months since the Brewers acquired him from the Orioles at the July 31 non-waiver trade deadline. Nevertheless, considering what the the Brewers gave up for Schoop, they’re “unlikely” to non-tender him in the offseason, Tom Haudricourt of the Milwaukee Journal Sentinel tweets. Schoop’s projected to earn $10.1MM in his final trip through arbitration, and that salary figures to help weigh down the 27-year-old’s trade value if Milwaukee tries to move him. Schoop was one of the game’s best second basemen in 2017, but his numbers dipped in the first half of this season with the Orioles and have gone in the tank in Milwaukee, with which he batted .202/.246/.331 in 134 regular-season plate appearances. And while the Brewers will advance to the World Series if they win Game 7 of the NLCS on Saturday, Schoop hasn’t been a factor in their playoff run, having gone hitless in seven at-bats. Unsurprisingly, Schoop’s not in the starting lineup for the Brewers’ series-deciding game against the Dodgers. Fresh off his second straight 20-home run season, one which featured unspectacular overall production (104 wRC+) across 496 plate appearances, White Sox DH/corner infielder Matt Davidson would like to do more pitching in 2019. Davidson, who chipped in three scoreless innings of one-hit ball as a reliever in 2018, will spend the offseason working to become a legitimate two-way player, Bruce Levine of 670 The Score reports. The White Sox have okayed Davidson’s plan and will be able to monitor his progress in the offseason, given that he lives close to their Arizona-based complex, according to Levine. Davidson was a high school pitcher, notes Levine, who writes that Chicago’s coaching staff sees “decent movement” in his 92 mph fastball. Should Davidson achieve his goal, the soon-to-be 28-year-old would work out of the bullpen – albeit not in high-leverage situations – as a way to help keep the team’s conventional relievers fresh, per Levine. Derrick Goold of the St. Louis Post-Dispatch reported earlier this month that the Cardinals would seek left-handed relief help in the offseason. President of baseball operations John Mozeliak confirmed as much this week, saying (via Jenifer Langosch of MLB.com): “When you’re looking at last year versus this year, I do feel like we’re looking at more depth than we had a year ago at this time. I also recognize that I think the biggest Achilles’ [heel] right now in our bullpen is the left side.” The Cardinals shuffled through numerous southpaw relief options during the season, but none inspired much confidence, as Langosch details; moreover, they don’t seem to have a dominant lefty under control going into 2019, Langosch points out. Notably, MLBTR’s Jeff Todd took a look at the lefty relief market for the upcoming offseason earlier this week. That piece should be of particular interest to Cardinals fans in light of Mozeliak’s comments. 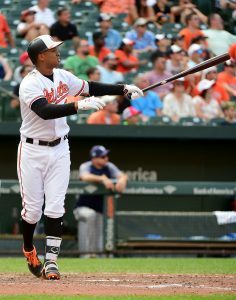 “There are rumblings that the Brewers will try to flip” Jonathan Schoop after the season, Roch Kubatko of MASNsports.com writes. If a trade partner can’t be found, Milwaukee might just non-tender Schoop. The middle infielder earned $8.5MM this season and, despite his struggles, will be due a raise in 2019 in his third and final year of arbitration eligibility. Schoop has posted just a .384 OPS over 50 PA this joining the Brewers, and he has only started two of Milwaukee’s last five games. 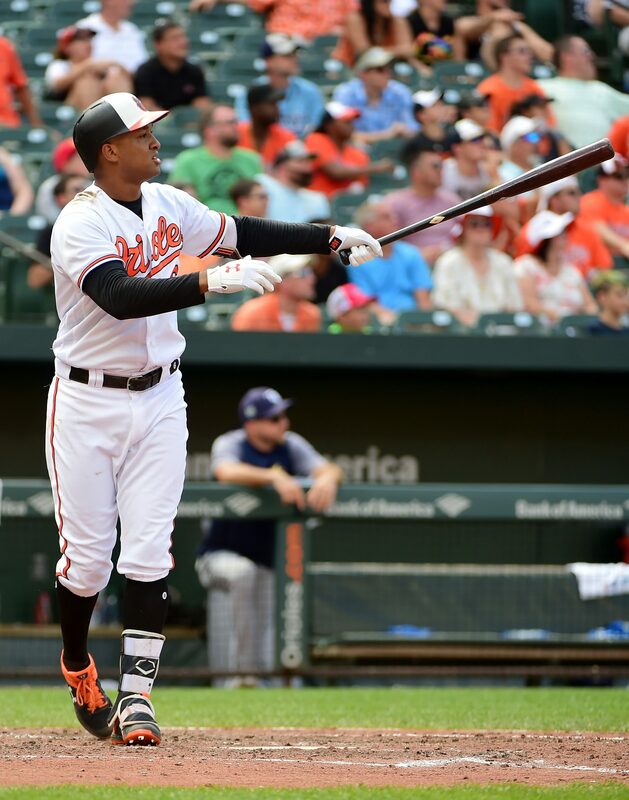 Barring a turn-around, it’s hard to see Schoop generating much interest on the trade front. After being designated for assignment by the Indians in the 2016-17 offseason, Jesus Aguilar told Tyler Kepner of the New York Times that he considered leaving MLB due to overseas interest. “I even was thinking about Korea and Japan,” Aguilar said. “When they put me on waivers, my agent was talking to me: ’They got people there. They want me there, too.’ ” This career crossroads ended when Aguilar was claimed by the Brewers, and the first baseman blossomed after receiving more playing time, hitting .280/.366/.579 with 29 homers and a league-best 89 RBI over 413 plate appearances this season. 3:39pm: The trade is official. 3:18pm: Feinsand further tweets that Jonathan Villar and minor league shortstop Jean Carmona are headed to the Orioles in the deal. 3:09pm: The Brewers and Orioles agreed to a last-minute deal that will send infielder Jonathan Schoop from Baltimore to Milwaukee just prior to the non-waiver trade deadline, reports Ken Rosenthal of The Athletic (on Twitter). Right-handed pitching prospect Luis Ortiz is among the players going back to Baltimore in the deal, reports Mark Feinsand of MLB.com (Twitter link). It’s no surprise that the Brewers made a move to upgrade at second base, and it’s one that could benefit the team beyond this season. After all, Schopp – who’s on an $8.5MM salary this season – has another year of arbitration eligibility remaining. After breaking out in 2017 with a .293/.338/.503 line, 32 home runs and a 3.8 fWAR in 675 plate appearances, Schoop has taken steps backward this season. The 26-year-old has slashed a below-average .244/.273/.447 with .7 fWAR over 375 PAs, though he has gone on a home run-happy tear of late to raise his numbers to more respectable levels. Schoop now has 17 homers after mashing seven long balls since July 20. While Schoop’s overall production has been pedestrian this year, it still easily outdoes the .231/.288/.351 showing Brewers second basemen have compiled in 736 PAs. That obviously wasn’t going to cut it for Milwaukee, which is currently in wild-card position and trails the NL Central-leading Cubs by a game. Villar was part of the problem over the past year and a half for the Brewers, with whom he had a great season in 2016. Now 27, Villar has scuffled to a .248/.302/.374 line with 17 HRs in 715 PAs dating back to 2017, essentially making him a replacement player, though he has stolen 37 bases in that span (including 14 on 16 tries this year). He’ll provide the rebuilding Orioles an immediate successor to Schoop and could be a multiyear piece for the club, which will owe him the rest of a $2.55MM salary in 2018 and could control him via arbitration through 2020. For now in Milwaukee, Schoop will add to an already crowded infield picture. The team just reeled in third baseman Mike Moustakas last week, forcing Travis Shaw to second. Unlike Moustakas and Shaw, Schoop is a right-handed hitter, though all three have struggled against southpaw pitchers both this season and throughout their careers. In addition to Villar, Baltimore picked up a pair of prospects who ranked in the top 15 of Milwaukee’s above-average system at MLB.com. Ortiz (No. 7) is a 22-year-old who has worked to a 3.71 ERA/3.85 FIP with 8.6 K/9, 2.38 BB/9 and a 48 percent groundball rate in 68 Double-A innings this season (16 appearances, 11 starts). Jim Callis and Jonathan Mayo of MLB.com posit that Ortiz has the ceiling of a No. 3 starter. As for Carmona (No. 14), the two prospect gurus write that he “has all the components needed to become an impactful player at the highest level.” Still just 18 years old, Carmona has hit .239/.298/.406 in 172 PAs at the Rookie level this season. 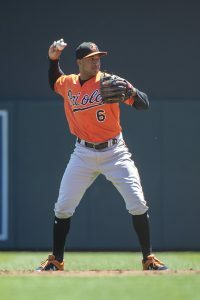 For Baltimore, the removal of Schoop from its roster is the latest significant move with the team in the early stages of a rebuild. The Orioles have also dealt shortstop Manny Machado, relievers Zach Britton, Brad Brach and Darren O’Day, and starter Kevin Gausman this month, thus revamping their roster in a last-place season.